S-12000 Heavy Duty Degreaser is a fortified multipurpose cleaner formulated to remove deeply penetrated oil, grime, other contaminants and surface residue from concrete. For interior and exterior use, S-12000 Heavy Duty Degreaser is a great alternative to muriatic and other acids. Use this product to clean concrete surfaces prior to the use of S-1300 Pene-Krete® to encourage the strongest reaction within concrete pores. Heavy Duty Degreaser will clean the toughest dirts, soils and greases making it the perfect cleaner for use in automotive shops, kitchens, and industrial facilities for industrial strength cleaning and maintenance. Ready to use. Do NOT dilute. S-12000 Heavy Duty Degreaser is a very strong cleaner and degreaser. It is used regularly in everything from commercial kitchen areas, restaurants, hospitals, auto shops, parking lots, and more. It offers a combination of emulsifiers, solvents and highly alkaline builders which penetrate and route out heavy grease, soil and grime. 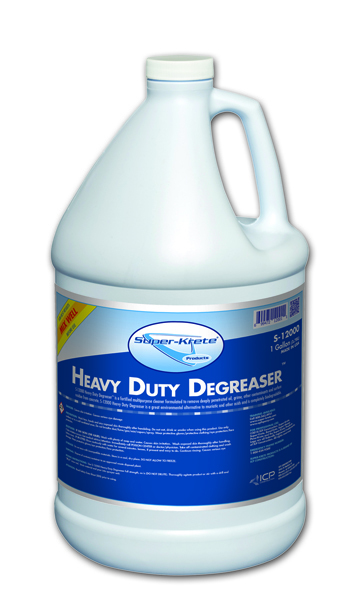 S-12000 Heavy Duty Degreaser is designed for heavier soil loads that lower alkaline products will not remove. *Coverage rates will vary, this is an approximation only. Actual coverage will vary depending on substrate conditions, surface porosity, ambient conditions and method of application.